Now that the holidays are over, it's officially the "bleak midwinter". With little to look forward to until spring (read: my birthday), it's easy to get into a wardrobe rut. I'm of the opinion that it's possible to beat the midwinter blahs through a well-planned wardrobe. Although it's still absolutely necessary to layer up, it's fun to experiment with color palettes that wouldn't normally be associated with the cold season. 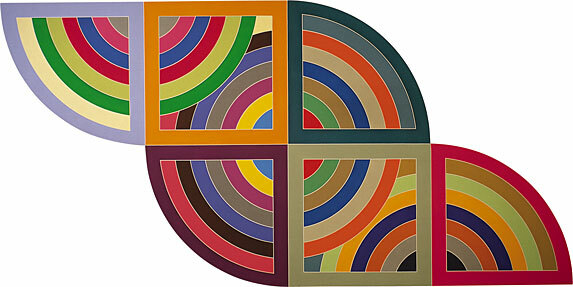 This ensemble was inspired by the colorful minimalist works of Frank Stella. Stella (b. 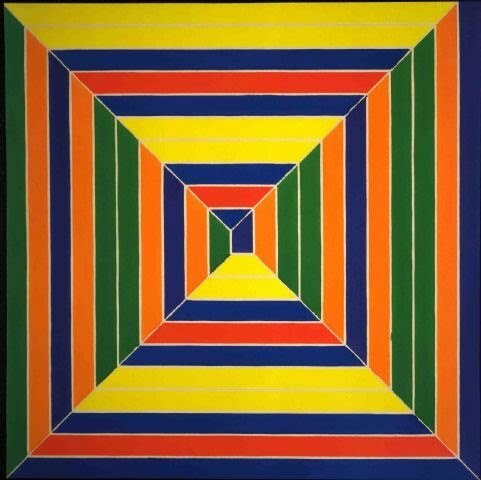 1936) is an American painter and sculptor most closely associated with the Minimalist movement. During his early career, Stella was interested in making pictures that were art objects in and of themselves, not pictures that depicted something else. Stella's early works were very minimal: simple unprimed canvas with black paint, in some cases. 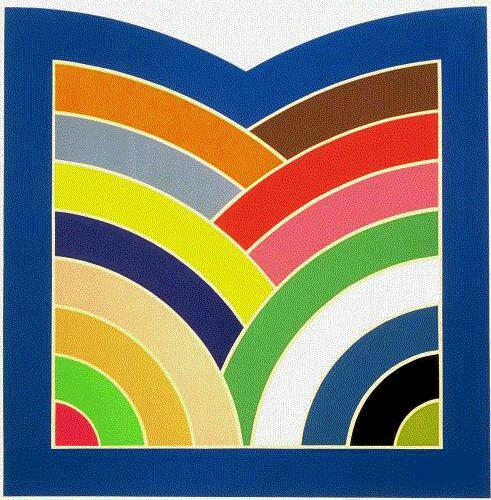 These works are from the 1960s to 1970s and represent Stella's experimentation with color and shaped canvases, which further complicated the work's status as object versus depiction. Minimalism like Stella's came to be a representation of the 1960s aesthetic, as seen in art, architecture, home decor, and fashion. Although minimalism has lost some of its caché in recent years, it represents an important art historical movement that developed in response to Abstract Expressionism. This vintage skirt was a recent thrift find, and I thought it bore a striking resemblance to the colors and patterns of Stella's paintings. For me, the colors of this outfit (and smart layering) made a chilly midwinter day a bit more bearable. Amazing picture! I love the colors on the skirt! REL, when you shorten the skirt don't forget to re-purpose the extra fabric. I can just imagine it as a scarf or purse or even framed as art. this is great! Love the geo skirt and the shoes. I need COLOR in my life!! I love these colourful prints, and your header. Thanks for sharing the photos and drop by me too when you have time. don't try richard serra but maybe james turrell? Wardrobe vs. Weather. I like it. Amazing Colors!!! I love wearing colors that are out of season. It makes it so much fun to get dressed!!! Love your skirt and these paintings! most definitely love the last picture the most, and the skirt is BEAUTIFUL! love it all! that skirt is beautiful and that last photo looks like something out of a magazine - so divine! Love the punch of color! So bright and cheerful. Sometimes I also do this kind of comparisons! Love how you collaborated this! Beautiful outfit!! I've decided one of the things I love most about your blog is finding out the artists' names and backgrounds behind works of art i've known and loved for a long time...perfect! UGH GOD I LOVE THIS! Your outfit is amazing, especially for the dead of winter. Very amazing incorporation with Stella's work, it's impeccable! love that you're wearing a lot of colour - and those marni's, wooo! what an amazing thrifted skirt! i definitely see the direct influence! These are such interesting prints! I like it. <3 The art is lovely! Thanks for following me. I followed you back! wowwwwww, I love all your outfit, it´s perfect!!! beautiful pics!! thats such a gorgeous skirt!! Oh, that skirt! I love it! It's really just perfect. It has a southwestern-inspired feel to me and it would be so fun to build an outfit around it! So many different ways to go with a great piece like that! I love all of the colors you're wearing- you really make them POP and they're beautiful on you! I love that color sweater! cannot wait for spring also! This skirt is so cute and how smart to shorten it and be able to wear it all Summer also! I adore your blog. I love going through all your posts and seeing how you've combined art and fashion, it's so inspired! This outfit is gorgeous. I love the skirt. the colors of the skirt is beautiful, looks good on you!